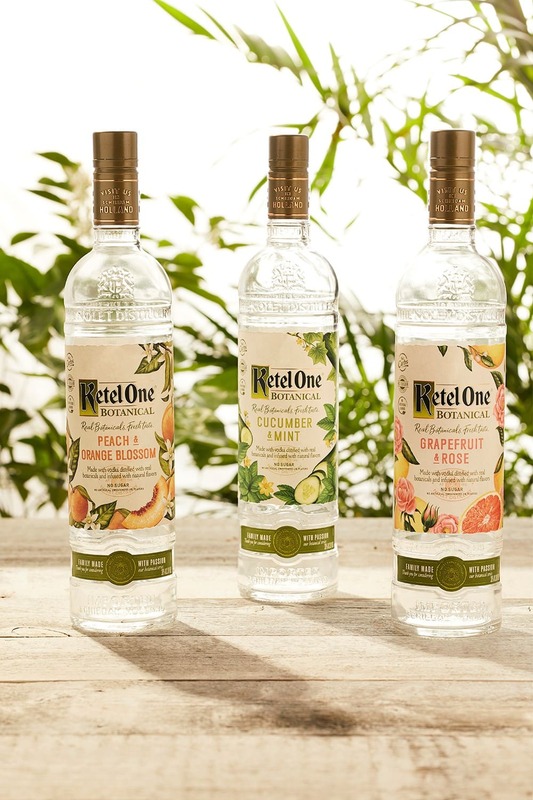 Ketel One just released Ketel One Botanical, a spirit that begins with Ketel One Family-Made vodka made from 100% non-GMO grain. It’s then blended with the secret family botanical recipe, re-distilled, and infused with naturally-extracted fruit and botanical essences. It’s like vodka lite. Or diet vodka. Or diet-ier vodka. It’s a word. Don’t look it up. Now, before you run away screaming, we’re going to let you in on a spoiler: It’s actually good. In fact, it’s tasty AF. It’s like they captured summer time in a gorgeous bottle. Will Smith not included. Seriously, just look at these beauties. And the best part is that it’s healthy for you! Well, depending on your definition of healthy. Ketel One Botanical has no carbs, artificial flavors, added sugars, or artificial sweeteners of any kind, so if you were really hoping for a brain-searing sugar-induced hangover, that’s a no go. 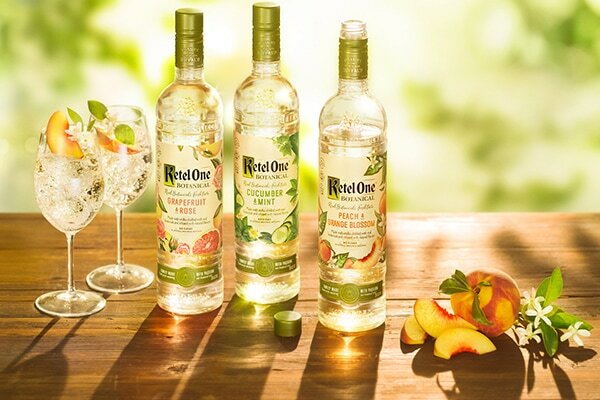 What Flavors Is Ketel One Botanical Available In? Cucumber & Mint: Cool, refreshing cucumbers with subtle notes of mint. Like your favorite shampoo from back in the day, but without the overpowering flavor of soap. Peach & Orange Blossom: Mouth-watering white peaches with aromatic orange blossoms. Nerdy racoon here with a fun fact: nectarines and peaches are the same except for a recessive allele that gives nectarine a smooth skin. Science! Grapefruit & Rose: Bold grapefruit with a slight hint of rose petals. You’ve been saying you were going start eating more citrus. Is Ketel One Botanical Actually Vodka? Technically, no. Sorry to let you down. According to the U.S. distilled spirits categorizations, vodka must be “without distinctive character, aroma, taste or color,” and must contain at least 40% alcohol-by-volume (ABV). The Botanicals have an ABV of 30% and are made by distilling fruit and herbal essential oils. Flavored vodkas add ingredients to grain alcohol, but they don’t re-distill them. Remember, the higher the ABV, the more calories your drink has (these have 73 vs their classic vodka which has 96), and the increased likelihood of you texting your ex in the middle of the night. But the Ketel One Botanicals are at least classified as a spirit. And that definitely counts for something! How Does This Not Have Any Carbs Again? Ketel One Botanical has 73 calories…but not carbs, protein, or fat. If you’ve ever paid attention to how food works, this might be confusing. And while carbs are not the devil, they are very trendy to avoid. If that’s the case for you, might we suggest these low-carb Chocolate Peanut Butter Keto Fat Bombs? Denis Faye, nutrition expert and Nutrition Nerd explains where the calories in vodka come from. “There are four things that have calories: carbs, protein, fat, and alcohol. I hesitate to refer to alcohol as a macronutrient but that is what it is.” Faye explains that gram of alcohol has 7 calories, which is where the Botanicals get their calories, since they have negligible amount of everything else. So, essentially, they’ve distilled (and re-distilled) the Botanicals to the point where all the fat, protein, and carbs have been almost entirely removed from the spirit and what you’re left with is the alcohol. And flavor. A.k.a., all the good stuff. Straight from the bottle! Just kidding, but it’s so easy to make a vodka soda that we’re willing to take the few extra steps to enjoy this non-vodka vodka cocktail. Fill a short tumbler with ice cubes. Pour 1.5 oz. chilled Ketel One Botanical into glass. Top with 3 oz. cold club soda. Finish with the garnish of your choice (fresh fruit, citrus, mint, the tears of your enemies. Easy and more sophisticated than drinking it straight from the bottle. Not that we would ever judge you…out loud. How Else Can I Drink Ketel One Botanical? If regular club soda isn’t bougie enough for your expensive tastes, may we suggest La Croix? Here are a few vodka soda recipes we discovered with the help of my friends who were suddenly super available to hang out. Thank God for real friends. Not sponsored. We just dug these and thought you should know about them. Also delicious sipped straight. Yes!! The grapefruit and rose is so good! Will definitely have to try the other kinds! Um, this is amazing. I’m a big fan of vodka cocktails in the summer, and this is one I can feel good…okay, “good”…about 😀 I have a college friends reunion coming up in a week and a bottle of this will definitely be purchased!! I could use a (few) glass(es) right now – I wish they had some in my part of the world! This is perfect for summer. I need to try this one soon. Saving this for summer get together. That peach and orange blossom sounds like it’s calling to be in a glass of sweet tea with me on my porch this summer! Looks like I have a new drink for the weekend! Thanks for sharing! Isn’t it though? We still have a bottle here at the… wait, nope, we need to go get more. Have you tried the other flavors yet? I really enjoy the cucumber mibt with fever tree tonic and sliced strawberries! Nice and refreshing! Tried the Cucumber Mint first. Awful. It was like drinking pine needle sap. Not that I ever tried pine needle sap but it actually tastes like gin. My least favorite spirit. Im very disappointed. I may get the courage to try another flavor. I certainly wont buy an entire bottle for sure. Oh no! Well, everyone has a different palate. We really loved the Grapefruit Rose one, but we also love strong flavors. What do you typically like to drink? Maybe we can help guide you towards another spirit you may enjoy. Tears of your enemies is on what aisle?? They’re most commonly found at high school reunions. But, if you’re in a pinch, aisle four.